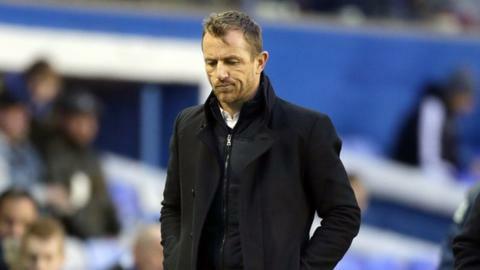 Birmingham City's players say they need to get over the 'rough patch' which has coincided with job rumours surrounding manager Gary Rowett. The Blues board were forced to issue a statement confirming that Rowett will stay, after speculation linking him to both Fulham and Queens Park Rangers. "When a manager is linked to another club, there is some difficulty," Blues defender Jonathan Spector told BBC WM. "It was impossible to be oblivious with the amount of publicity it got." He continued: "We're delighted he's staying and maybe we can push on now. We've had a little bit of a rough patch of late and we're looking to improve on that." Dutch midfielder Maikel Kieftenbeld took a wider view of the whole recent rumour mill surrounding the highly-rated Rowett, who is now high up in the betting market for the latest managerial vacancy at Swansea City. "Of course it bothered me," said Kieftenbeld, Rowett's first summer signing. "But I have learned in my career so far that you don't play for the manager. He can leave any time. You play for yourself, to improve yourself and then every manager will play you." Blues only beaten by the best . . .
Birmingham City's only two away league defeats this season have been against teams led by former Blues managers, Steve Bruce's Hull City and Chris Hughton's Brighton. Bruce's Hull climbed to second in the Championship as a result of beating Blues. Then, a month later, Hughton's Brighton beat Blues to go top. The same could happen again this Saturday if Blues lose at second-placed Middlesbrough - and Brighton fail to win at Derby. Ahead of Saturday's trip to second-placed Middlesbrough, Rowett is as eager as the players to end the run of four losses in six games which have dropped them from sixth to eighth in the Championship table. They have not been helped by injuries to top scorer Clayton Donaldson and Wales winger David Cotterill, which have also had a negative effect on England Under-20 star Demarai Gray. "Dimmy's just one over the past six games who has not performed as well as he had done previously, but he's not the only one," said Rowett. "It's been a fantastic run to get where we've got to and maybe we've been punched a little higher than we should have done, but we've been not quite tough enough, not quite aggressive enough. "You've got to question whether some of the players have been maybe happy getting to sixth, that whether for us is was like getting to the top of the table, and whether they have that extra desire to take us forwards."